Mr. Backster expanded on conventional polygraph techniques, leading to the development of the Backster School of Lie Detection and the Backster Zone Comparison Technique, which involves discerning subtle shifts in the consciousness or psychological set of a person being tested by a polygraph. He also developed the first system to numerically evaluate polygraph charts, which has become the standard in the field of polygraph science. During his early career, Mr. Backster was actively involved in hypnosis, even post-hypnotic suggestion, whereby an idea is given to a subject while in the hypnotic state that can be used when not in hypnosis. In fact, he was so good at hypnosis that his talent was utilized by the US Army Counter Intelligence Corps and the Central Intelligence Agency. 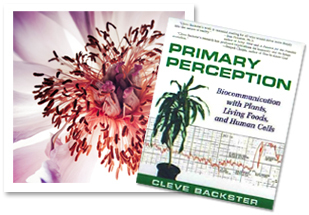 However, in 1966 Mr. Backster shifted the focus of his work when he stumbled on the idea of plant perception; that is, the ability of plants to respond to stimuli and the presence of other living organisms. 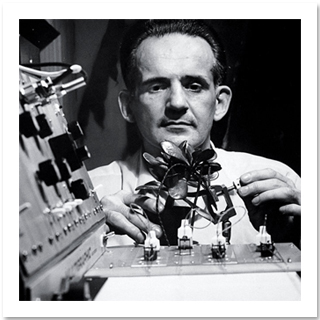 To test this notion, he first decided to measure the rate at which water rose in plants from the roots to the leaves by placing the leaf of a dracaena plant between two sensor electrodes and encircling the sand­wiched leaf with a rubber band while connecting the sensors to polygraph equipment. The result was a reaction similar to those of human subjects experiencing fear of detection. This finding was so amazing that he began to test more plants under strict controls to see if he could get additional human-like reactions. In Backster’s next experiment he held a match and acted as if he were threatening a plant’s well-being. The polygraph readings he obtained were similar to those of humans when they are tired or bored. Next he decided to study a plant’s reaction while he was picturing in his mind a clear intention to burn one of its leaves. No words were spoken, no match was lit and the plant was not touched, but as if the plant “could read his mind,” the polygraph machine recorded a dramatic reaction by spiking to the top of the chart! To the plant, the researcher’s intention was clear and real, indicating that the organism distinguished his “what if” ideas (no reaction) from his clear intentions (drastic reaction to a threat to its well-being). Moreover, other plants that still had sensors attached to them also reacted. For his first published article, Mr. Backster set up an experiment to see if plants simultaneously monitored in three different locations (adjoining rooms), would react to the death of another life form (brine shrimp). The monitored plants had an electrode clamped to one of their leaves, and there was also a control polygraph against which the readings from the three electrodes attached to the plants would be measured. The polygraph instrument was in a separate room, and a timing device to terminate the shrimp was in yet a third room. An aspect of controlling the experiment was to arrange it so that the plants did not attune themselves to the researcher so he left the building. Backster then found that the plants with the electrodes attached simultaneously reacted strongly to the termination of the brine shrimp. Moreover, one day Backster noticed tracings from an unfertilized chicken egg attached to electrodes and a galvanic skin response machine that were similar to human pulse beats on a polygraph chart, except they were much more rapid. However, the speed observed was approximately 157 beats per minute, the heart rate established by previous studies for a chicken embryo around three days along in incubation, and this study went on to demonstrate strong evidence of an egg’s bio-communication with the external environment. In another experiment, Backster placed electrodes on an egg for an electrocardiogram recording and set up ten other eggs to be “pushed” into boiling water. Upon returning to his lab, the researcher was surprised to find only one chart reaction from the electroded egg when the first of the ten eggs descended. It appeared that either the first egg entering the boiling water or possibly the electroded egg in effect “noti­fied” the other nine eggs of impending danger, caus­ing them to go into a defensive state equivalent to fainting. He did additional experiments where he again encountered the “fainting” response so he put the experiment on hold. However, he acknowledged that the eggs seemed to be somehow com­municating with each other. These findings support Master’s teaching regarding eggs: “When we eat eggs we are also killing beings. Some say that commercially available eggs are unfertilized, so eating them is not killing living things. This is only seemingly correct. An egg remains unfertilized only because the appropriate circumstances for its fertilization have been withheld, so the egg can not complete its natural purpose of developing into a chicken. Even though this development has not occurred, it still contains the innate life force needed for this. We know that eggs have innate life force; otherwise, why is it that ova are the only type of cells which can be fertilized” (from the article ‘Why People Must Be Vegetarian’ from The Key of Immediate Enlightenment sample booklet). Cleve Backster has maintained a working Bio-communication laboratory for forty years where he continues to conduct such experiments, many of which are discussed in his book. This work supports the view that perception (the process of using the senses to gain information about the environment or current situation), and attunement (becoming receptive or responsive to something else) are qualities possessed by non-human life forms. The results of Mr. Backster’s research reached the U. S. public through his interviews with prestigious TV talk show hosts such as Johnny Carson, Art Linkletter, Merv Griffin and David Frost. And with his so-called “Backster Effect” eventually attracting worldwide attention, Mr. Backster’s original methods are now being adapted by other scientists studying primary perception in plant cells, bacteria and human cells, who have observed that human cells and DNA respond to thoughts and speech.